Guard Your Thoughts Against Calvinism with CALVINIX! For some good theological humor: http://tominthebox.blogspot.com/2007/02/guard-your-thoughts-against-calvinism.html. 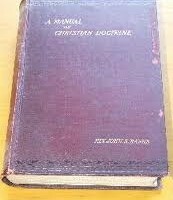 Please click on the link to view: John Shaw Banks, A Manual of Christian Doctrine (1902). Roger Olson, Review of Whosoever Will: A Biblical-Theological Critique of Five-Point Calvinism, at the “Baptist Theology” website.